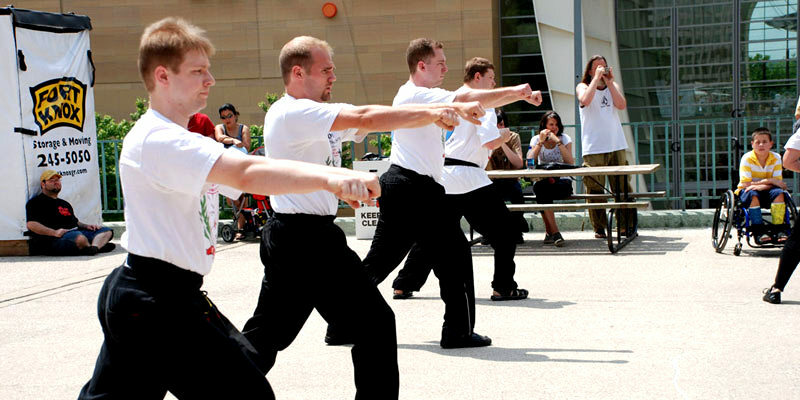 Our style is Tai Chi Praying Mantis Kung Fu (Tai Chi Tang Lang), from the lineage of Grandmaster Chiu, Chuk Kai. Each class is run by Master Lee, along with assistant instructors Rick Powell, Nancy Benedetti, John Winkelman, Mark Van Kuik and Tracy Olmsted. Classes consist of warmup calisthenics, stance and kicking exercises, body conditioning and kicking drills, and forms. As students progress they will learn a wide variety of self defense techniques. 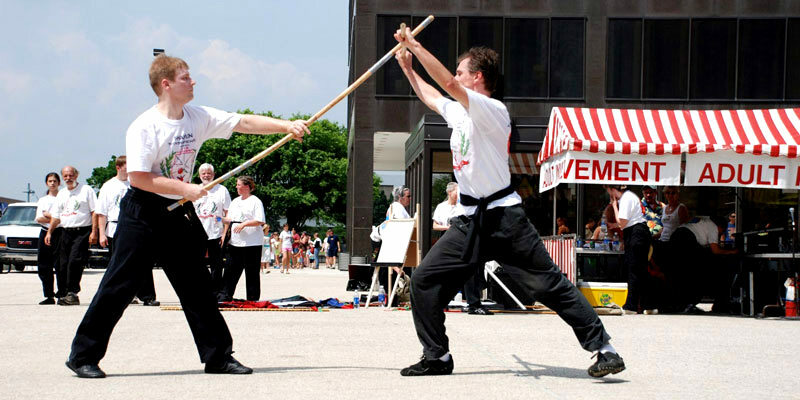 We teach a wide variety of forms, including single- and two-person empty hand forms, and many weapons such as the stick, dao (curved sword), spear, daggers, yao dao (halberd), and cane. We also teach many two-person weapons forms, such as spear vs. sword and daggers vs. umbrella. The class meets at the downtown Grand Rapids YWCA on Thursdays from 7:00 pm to 8:30 pm, and Saturdays from 11:30 am to 1:00 pm. According to legend, Praying Mantis Kung Fu originated in Shandong Province, China. It was created by a renowned swordsman named Wang Lang, around the end of the Ming dynasty. Wang was a gifted child who had loved martial arts since he was very young. He started training at a very early age, with the goal of perfecting his Martial Arts. Through the years, he learned from several well known masters of the time. Wang was a good friend of the Abbot of the Shaolin temple. He paid visits to the temple once in a while and met with the Abbot to discuss martial arts. Each visit ended with a friendly match, but he always lost to the Abbot. One summer day, on his way home after losing the match with the Abbot, he rested under a tree. Suddenly, he heard the loud noise of a cicada from a branch close above his head. He looked up and saw that a praying mantis had seized the cicada, which was twice its size, but the cicada was unable to get away from the powerful claws of the mantis. Wang Lang tried to save the cicada by separating them using his short sword. But as soon as the dagger reached close to the mantis, it used its agile claws to catch the dagger and in a blink of an eye, the mantis jumped onto Wang Lang’s hand and attacked him with its sharp claws. Amazed by the quick reaction of the mantis, he brought it home. After studying the mantis for a year, Wang Lang returned to the Abbot. Although he was swift and piercing with his movements, as the mantis had been, he was still unable to beat the Abbot. On his way home, Wang Lang stopped to rest under a tree and fell asleep. He was soon awakened by a monkey who was stealing his belongings. Wang tried to catch the monkey, but each time it moved back and forward, left and right, or up and down, and he was unable to seize it even though it was only a few steps away. It was then that Wang Lang saw what he had been missing. When he returned to the temple a year layer, Wang Lang used the swiftness of the mantis and the agility of the monkey to win the friendly match with the Abbot.